Swedish Fireknife | BUDK.com - Knives & Swords At The Lowest Prices! 3.75" blade with Scandinavian grind. Weight (w/ sheath): 3.4 oz. (94 g). Everyone needs a great knife for braving the wilderness. With this colorful piece, you get that plus a handy fire starter. The Swedish FireKnife is a collaboration between Light My Fire and Mora of Sweden, who has made top-notch knives for 120 years. 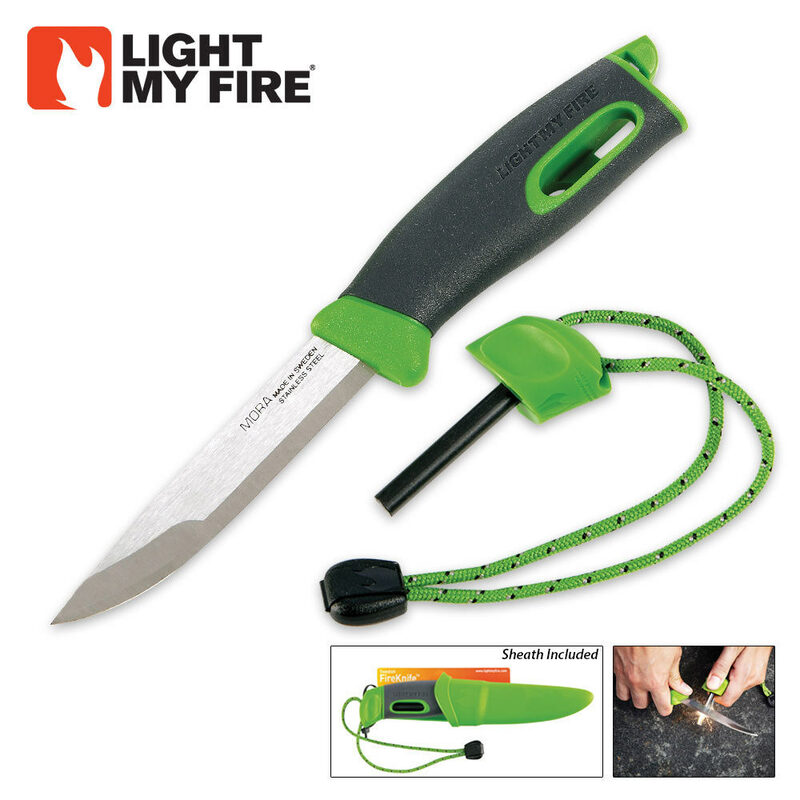 But this is more than just an extremely sharp, flexible, and sturdy all-around knife: the handle contains a fire starter. In other words, you can gut and clean a fish, split kindling and light a campfire with one single handy tool. An original Swedish FireSteel® Scout, with approximately 3,000 strikes, twist locks into the handle for lighting campfires, gas stoves, and barbecues. This Swedish FireSteel firestarter works equally well when wet, performs at all altitudes, and produces a 3,000°C (5,400°F) spark. Been looking for a belt knife for camping for the always at hand access. Pocket knives get lost in the 6 or 8 pockets I typically have in camping attire. I bought two knives to try out--a Timber Wolf 4" skinner with a nice wooden handle and this Mora fireknife. The Mora wins on practicality. Razor sharp, light, super durable waterproof sheath. The sparker clips securely into the handle. I was a little dubious about the plastic sheath and the fact that the knife doesn't clip to it. And that it's a belt clip instead of a belt loop. I need something that will not fall off in the woods or around camp. That's why chose safety orange color. But field testing it yesterday for several hours on the trail put all my fears to rest. There's no way the knife is going to fall out of the sheath or the sheath off my belt. The whole rig is pretty indestructible. I remember in my younger days hiking in with a foot long Rambo knife on my hip. Haha. Those days are gone. I need a knife to cut rope, fish and onions--not spear wild boar! This 3 and a quarter blade is the perfect size. This is going to be my go-to knife for camping. Worth the price.